The now-extended Nelsen clan joined together yesterday not just for the delicious home-cooked food, but for family fellowship. Dad gathered us together in the morning, between table-setting and food-prepping, for a family devotion centered on the attitude of gratitude. After a brief history lesson behind misconceptions of the holiday itself, he shared scripture to focus our hearts on thanksgiving. Psalm 100 – Make a joyful noise to the Lord, all the earth! Serve the Lord with gladness! Come into his presence with singing! Know that the Lord, he is God! It is he who made us, and we are his; we are his people, and the sheep of his pasture. Enter his gates with thanksgiving, and his courts with praise! Give thanks to him; bless his name! For the Lord is good; his steadfast love endures forever, and his faithfulness to all generations. Interspersed between passages, each of us shared something we were thankful for from this past year. We were reminded of the big things God has been doing in each of our lives and the way He has provided for our families. Having a spirit of thanksgiving should not be restricted to this time of year, but is a way to live our lives daily. Psalm 95:1-6 Oh come, let us sing to the Lord; let us make a joyful noise to the rock of our salvation! Let us come into his presence with thanksgiving; let us make a joyful noise to him with songs of praise! For the Lord is a great God, and a great King above all gods. In his hand are the depths of the earth the heights of the mountains are his also. The sea is his, for he made it, and his hands formed the dry land. Oh come, let us worship and bow down; let us kneel before the Lord, our Maker! We pray you had a very happy Thanksgiving with your families and will maintain the spirit of gratefulness throughout the year! 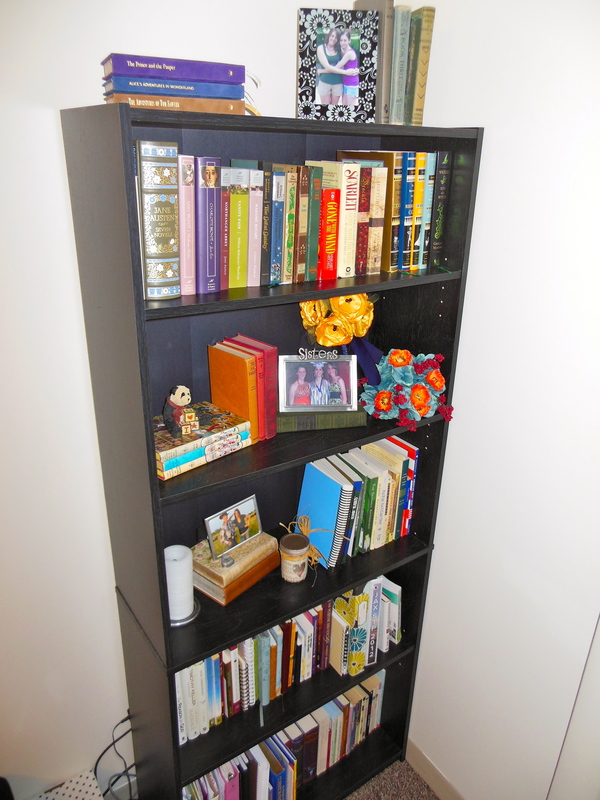 As my husband and I continue to settle into our apartment, I keep finding more small projects to do. For today, I finally finished my dry ingredient canisters. You can find the “cracker jars” at Walmart. I think they are very functional and look great! For now, I only needed them for my baking needs but you could always use them for other things like homemade mixes (brownie or pancake) or cookies and crackers. I chose to stencil labels onto them, knowing it would be temporary and easy to fix if I messed up. 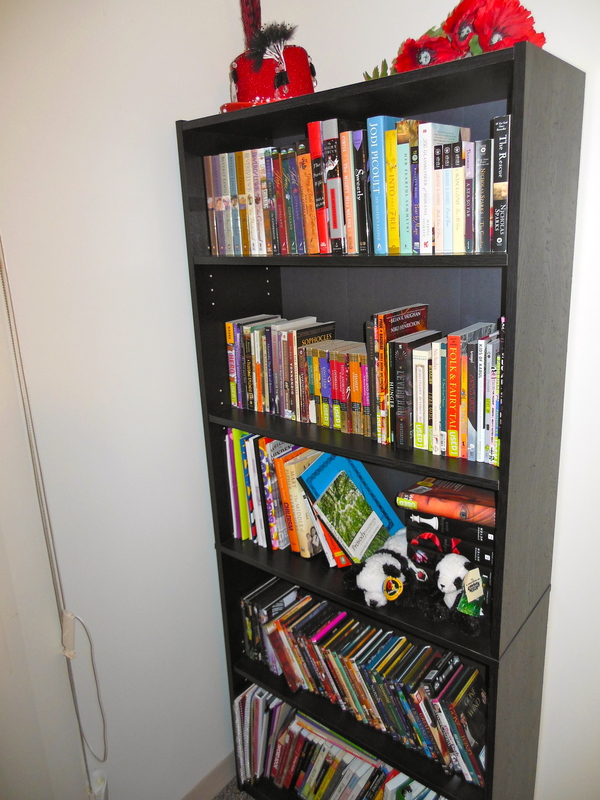 I was actually able to find everything I needed to complete the project in the apartment. No extra trip to the store! There are many other ways you could label the jars, I chose the cheapest for me because I had the supplies I needed. I printed off a font that was easy to read and sized it accordingly. Using an x acto knife, I cut the letters out and then taped the words to the jar. 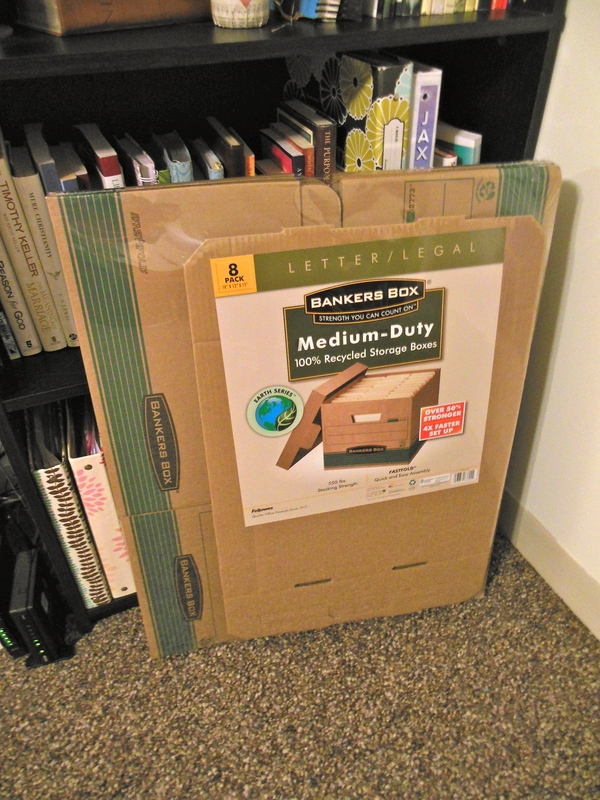 I would suggest that if you want to be closer to perfection use a heavier paper than general printer paper. (I wasn’t worried because I knew I could fix it by taking my fingernail or x acto knife to any blemishes.) To paint onto the jar, I used what I had on hand which was black acrylic paint. Sponge it on and you are almost done! It is best to take the stencil off while the paint is still wet, or you will have to redo the painting. I made the mistake of waiting too long on the smaller jars and ended up taking all the paint off when the paper was removed. However, wait until it is dry to fix any blemishes. I am excited to have NICE looking jars for my ingredients (with large enough openings for my measuring cups)! If I get tired of what the label looks like, I can just rub it off with a flat edge! Have you ever had the kind of day that when you get home, you have no motivation to do anything? I have those several times a week! I can barely get myself to cook. I have learned that meal planning does help somewhat in keeping me on track and feeding Nathan and I. Last week as I was searching for recipes to try I remembered my mom buying pork tenderloin pre-marinated. It seemed perfect for a night that I had no more motivation than to turn the oven on and stick a pan in. 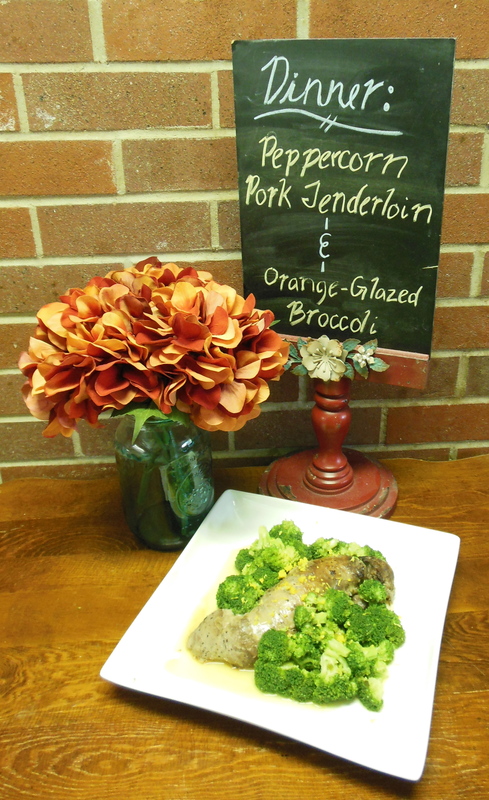 Of course, we couldn’t have only the tenderloin. I was craving broccoli and wanted to dress it up a bit. I found a super quick recipe in one of my Taste of Home annual cookbooks (2010 I believe). The tenderloin took about 30 minutes to cook through, while the broccoli was finished in half that time. It was a true 30 minute meal! I finally feel like it is summer! I finished my first year of college the beginning of May, but then jumped right into two summer classes the following week. I have been done for two weeks now and I am FINALLY getting into the summer groove. I know it has been a month since Mother’s Day, but I wanted to share flowers we potted that weekend. Nathan and I surprised my mom for the afternoon. (I always forget to call or buy a card so I figured a visit would be a gift!) I am so thankful that for this season of life they are only 2 hours away! It’s a nice get-a-way every once in a while. Anyway, I have been wanting to pot some flowers for a while now, but never got around to buying a pot. My mother is so wonderful that she shared one of hers that she isn’t using with me! Of course, I had to climb the ladder to the attic to get it, but I’m so glad I did because I found my old yellow mud boots from when I was 8. 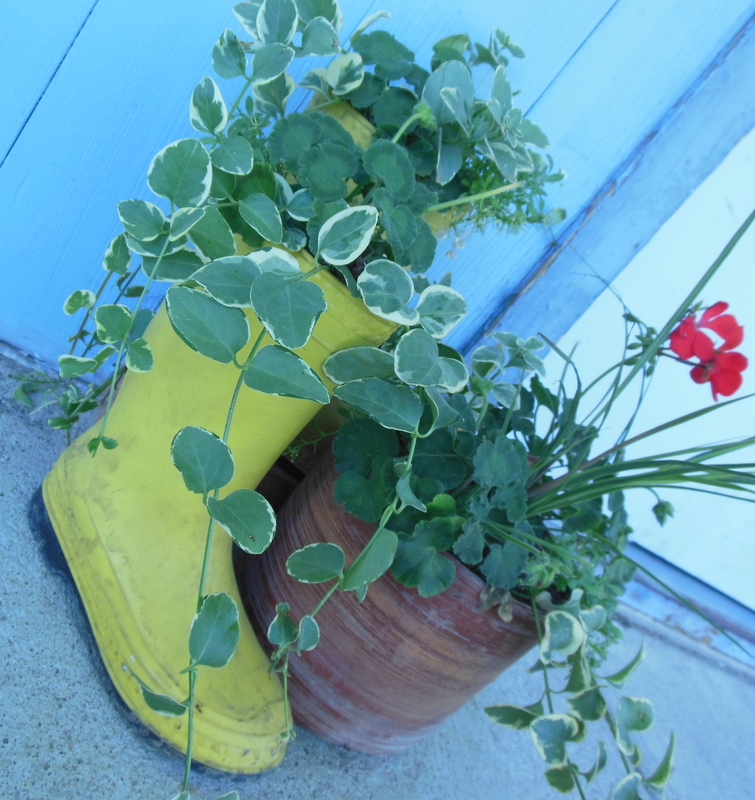 When I grew out of them, we potted flowers in one of them. So I decided, since they were mine after all, I should use both to add some playfulness to our entrance. So glad I took them home with me! Brings back some great childhood memories of the great outdoors. 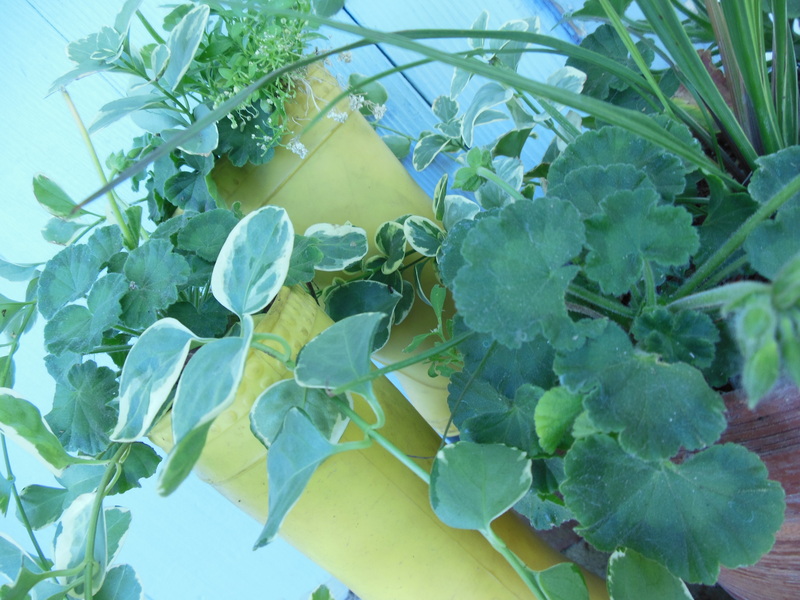 Do you have any creative ideas for adding plants to your outdoor space? All I See are Poppies! With all those coffee shops out there – you know what I’m talking about – does anyone out there ever invite friends over to their house anymore for coffee? Well I just did and we had a great time chatting up a storm. I’m thinking maybe I should do it a little more often. Time at the coffee shop for me usually means I am traveling with my husband and I have to find a place to land for a couple of hours while he works (attending meetings most of the time). I don’t mind – I love the atmosphere of the “coffee shop” but chatting with my friend in the privacy of my home can’t be beat. Here is a recipe I tested for my at home coffee experience. 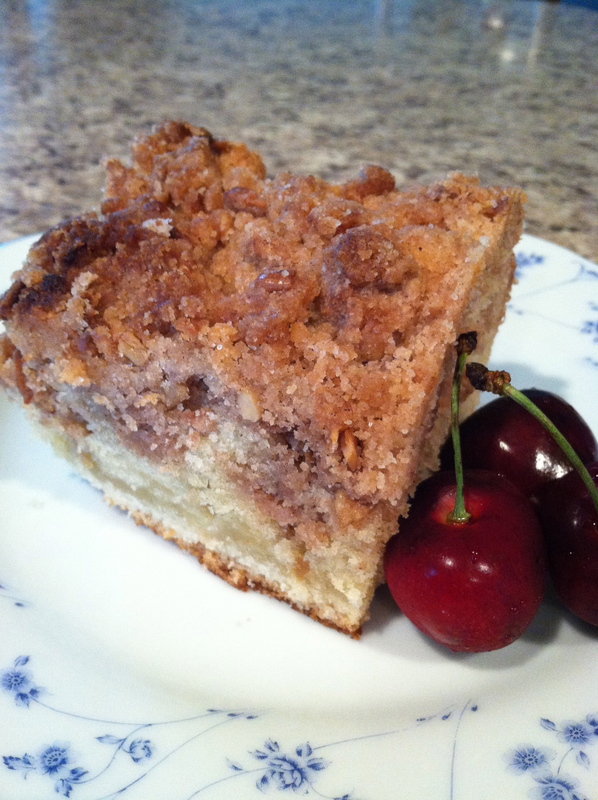 It is called Cinnamon Crumble Coffee Cake – I found it on www.bigoven.com. First of all the serving size says 4 and it is baked in a 9″ x 13″ pan. A bit crazy but probably an entry error. This is a very rich cake and eating 1/4 of it would be almost 3 days worth of calories. 1. 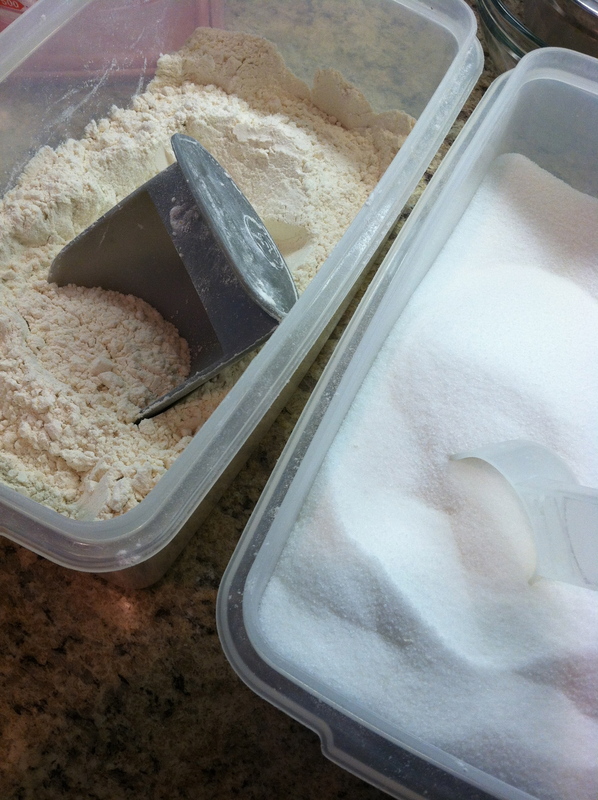 Mix together the flour, sugar, salt and baking powder. Add in the oil. 2. 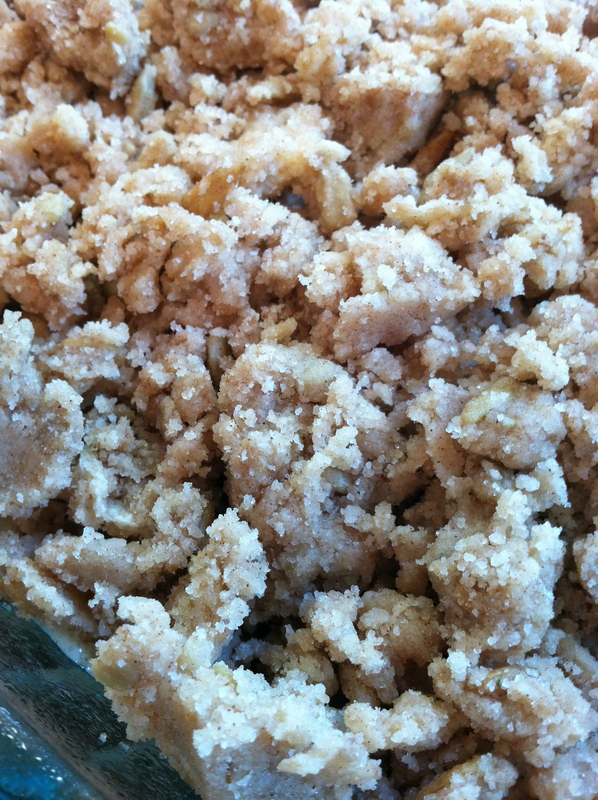 Divide this mixture – one half slightly larger than the other – into 2 bowls. 3. In the smaller portion add the eggs, milk and vanilla extract. 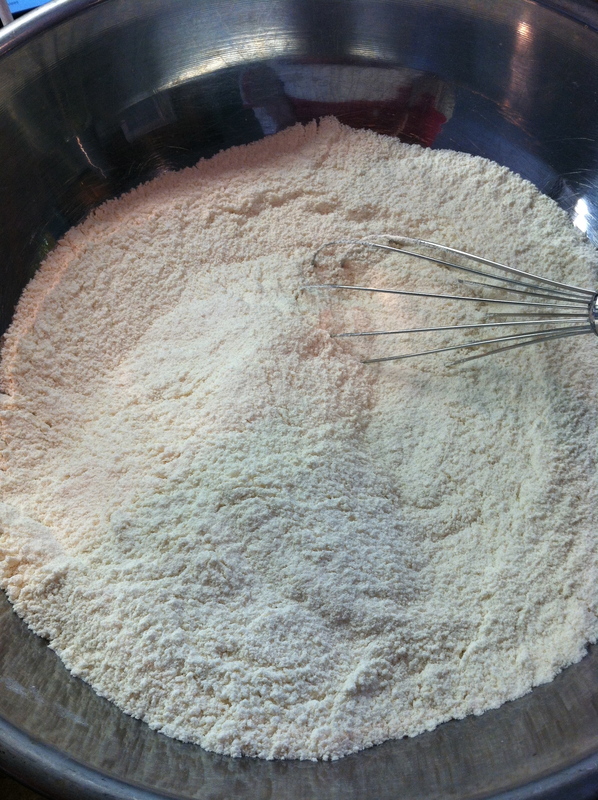 Mix well until free of lumps ( mixture will be thin ). Pour into greased 9 x 13-inch pan. 4. 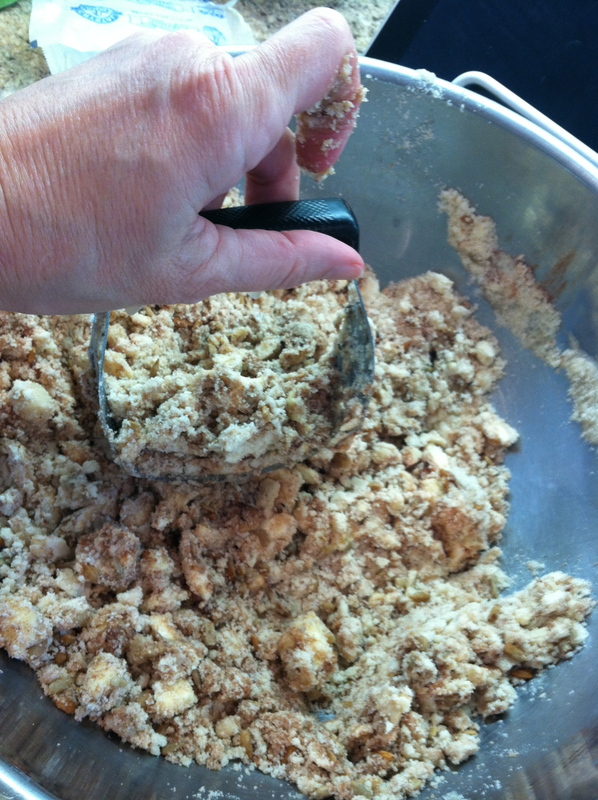 In the larger portion add the butter, cinnamon & nuts. 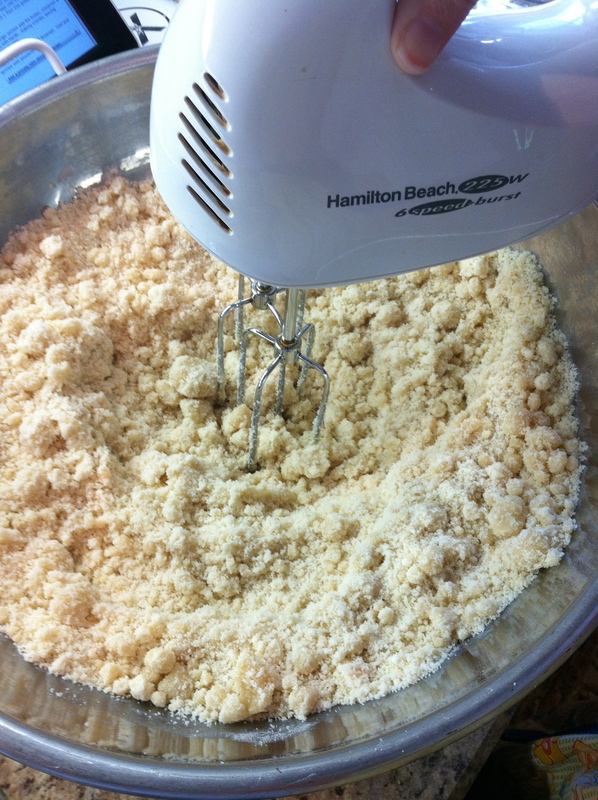 Mix with hands or pastry blender, making crumbs, leaving some large crumbs. Sprinkle over first layer in pan. 4. 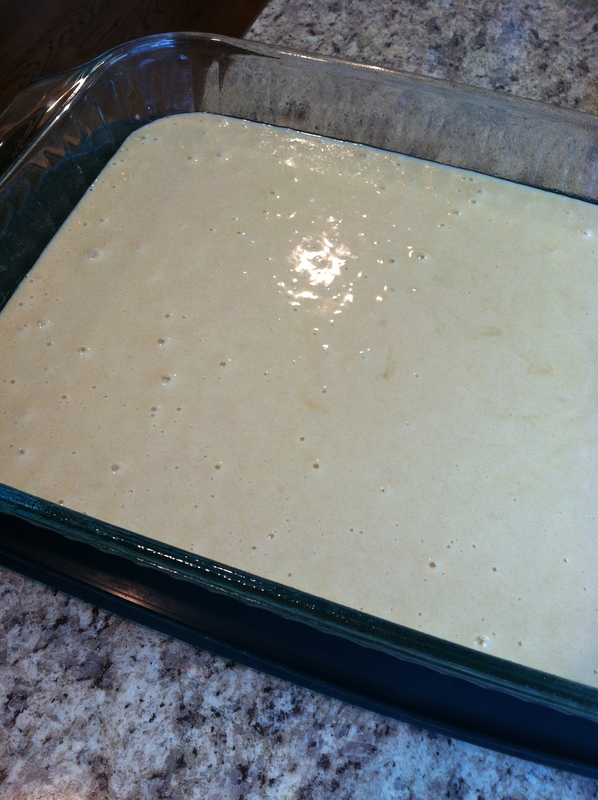 Bake for 25-30 minutes till browned. Cool and sprinkle with powdered sugar. This is best served warm of course. It is a bit heavy to my liking, so if you like rich foods this is it. Overall it is a good recipe but not sure I will make it again. Do you invite others over for coffee? This weekend we had our first Grace Elizabeth’s planning meeting. Saturday was full of brainstorming and decision making. You may notice we changed our look (one of the many outcomes of our meeting). Because the four women were hard at work, the two men lucky enough to be around (our father and my husband) catered our food. By the way they fed us BOTH lunch and dinner. Aren’t they awesome? Their lunch menu: Macaroni Cheese Soup and Garlic Grilled Asparagus. 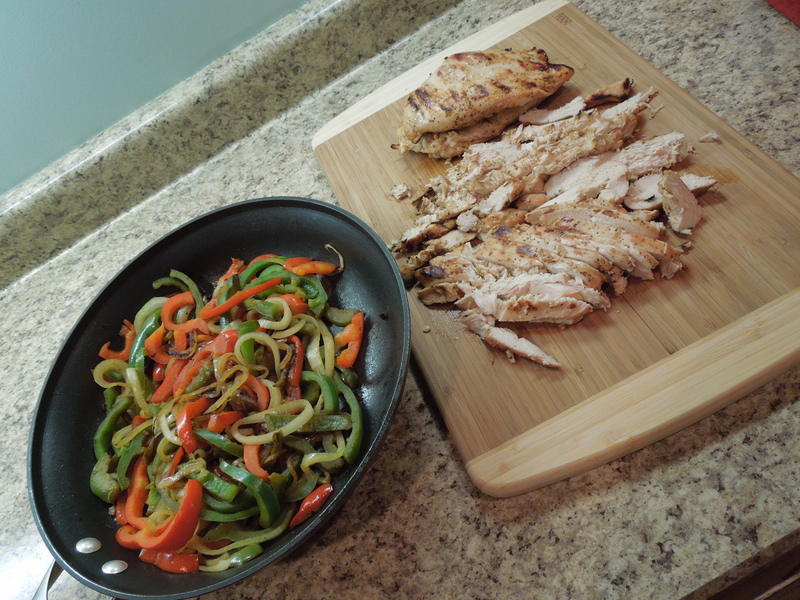 Their dinner menu: Grilled Chicken Fajitas and Spanish Rice. They are allowing me to share one recipe with all of you! Heat grill to medium-high. Grill chicken (6 min per side). Remove chicken from grill, cover, and rest for 5 minutes. Slice chicken and keep warm. Heat skillet over med-high. Saute onions and pepper slices in the vegetable oil for about 5 minutes. Combine soy sauce, water and lime juice in a small bowl then add to onion mixture. Add salt and pepper to taste and continue to cook until onions are dark on edges (about 5 minutes more). The men did a great job. No one went hungry! Wow! This week has flown by! I feel as though I am at full speed and yet have completed nothing. It is days like these that I would love to add a couple hours to the day. Of course that isn’t something I can change so I need to organize my time better. So today I have an announcement! Wedding pictures are in the mail! That means I will be able to share some with you in the weeks to come. So exciting! However, today I have more about the kitchen. Because I have been spending my time on school like a good college student, I haven’t been able to do the things I want to do. In my apartment complex the only windows on the front wall are small rectangles above the cabinets. Most people have boxes crowded on top of the cabinets. I personally didn’t want to do the same because then I would have to look at the mess daily. Instead I wanted to display things that showed my personality! My window display consists of: a “Kiss the Cook” sign (bridal shower gift from Nathan’s mother), hydrangeas, mason jars, and cake stands. I love the sign! However, I love it even more surrounded by the hydrangeas. When I was unpacking the cake stands, I thought displaying them would be much better than trying to store them somewhere. I would say now they are easier to get to but… I won’t be doing much baking. I have a compact oven which burns edges before the inside is even near ready. Ugh! Anyway, I also used wedding decorations for my table. 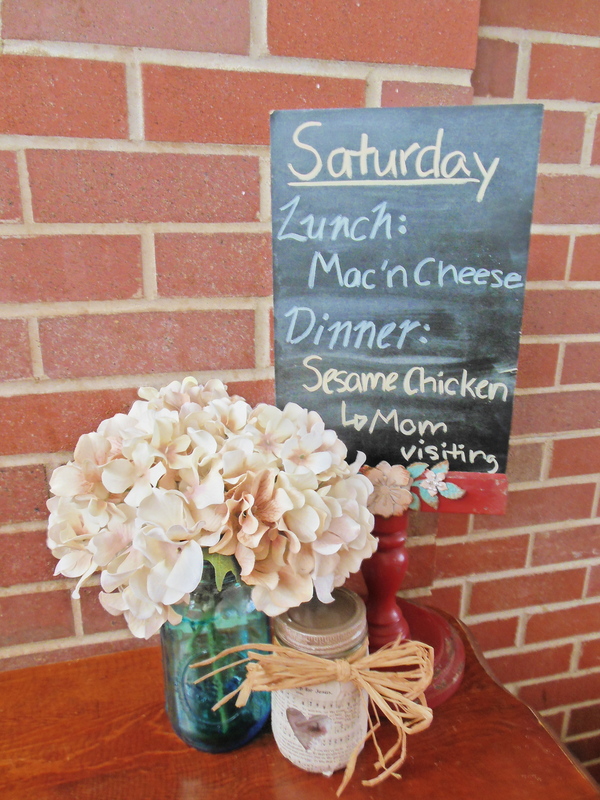 I have a chalkboard stand from Hobby Lobby that I use to write the meals for the day or just a note to my husband. Originally it gave the instructions at the guest table. I also used more hydrangeas and mason jars. I have to admit the kitchen is my favorite part of the apartment (not including the oven). Probably because I have put the most work into it so far! Remember to stop by next week! Wedding pictures to come!!!!! When I was looking for gifts to make for my family this Christmas, I came across this idea to make a monogram on canvas using embroidery thread. I thought the 3D look would be pretty cool, but I never realized how long it would take me to make three of them! This one is the first I made. Therefore, many mistakes were made because it was kind of an experiment. However, now I have a pretty good idea of how to complete this craft without too many mistakes! I started with canvas, embroidery thread, tape, white thread, and rope. I first played with the rope to decide what shape my letters should take. Then I taped the rope down to the canvas in the desired shape. After the rope is taped down, I took the white thread and tied down the rope about every couple inches or as needed to keep the shape. Then I started embroidering, keeping my stitches as close together as I could in order to fully cover the rope. After covering a little bit of the rope, I went back to the end or start point to try and cover the frayed edge. Then I kept going around the rope until it was all finished! Word to the wise – don’t poke unnecessary holes in the canvas because you will still be able to see them when you are all done. That is the biggest lesson that I learned when making the first monogram. Originally, I was using pins instead of tape to hold the rope while I used the white thread to secure the rope, but then I changed the shape of my letter, which uncovered the holes I made with the pins. I made a “J” and a “P” monogram as well, but my favorite was the “J” for my older sister and her husband because it had a really cute curl at the bottom of the letter. It was also made with this variegated brown thread which is going to look so nice in their home where they have been decorating with a lot of those neutral colors and a western twist to a lot of their decor. Overall, each monogram probably took me 5 or more hours to complete because the embroidery was slow going. I was using the entire length of embroidery thread each time, so that was a lot of thread to pull through each stitch I made. And with a long length of thread comes the problem of it becoming tangled, which happened quite often. However, I enjoyed making them for my family and can’t wait to see how they display them in their homes. What has been your latest craft project? Share below! We’d love to hear what you’ve been working on!